You’ll hear Dr. King starting at about ten minutes in. 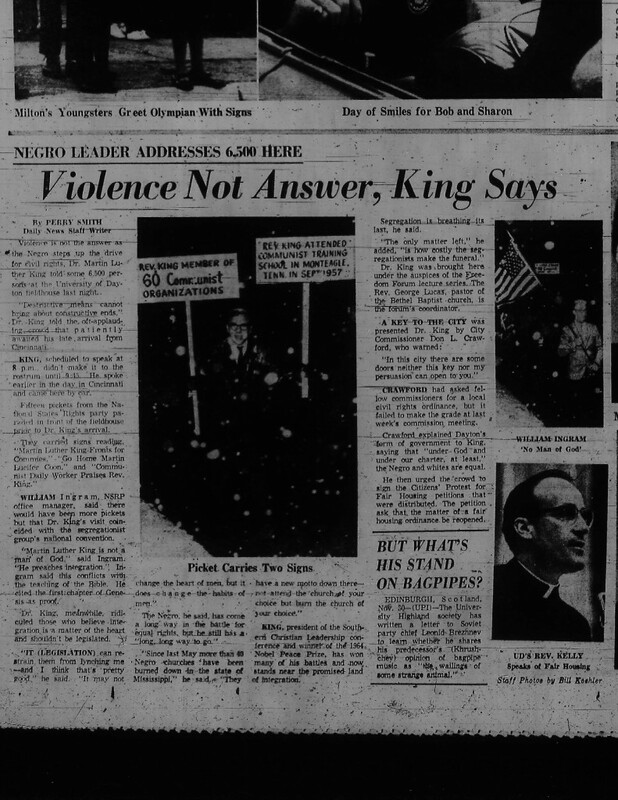 Dayton Daily News, Nov. 30, 1964. Courtesy of University of Dayton Archives, Dayton OH. Please click on the image to enlarge it. Sometimes history hangs by the width of a thread. A width of one-point-five mil in this case. That’s one-point-five thousandths of an inch, the thickness of acetate recording tape, a quarter inch wide and perhaps 900 feet long. Only about 600 feet really matter. The rest are blank. But those 600 feet REALLY matter and reveal old audio, newly discovered. During the Spring of 2008 while Ron Primeau and I were gathering footage and materials for Jump Back, Honey, we gathered at Herb and Sue Martin’s home for a picnic. I was shooting some casuals for the film…preparing food, interviewing the granddaughters, talking with their daughter, capturing scenes of chow time. It was a delight but we knew that there were plenty of things that had to go on even after the party: papers to grade, studying for a bar exam. So we left, and as we did, Herb asked us to help him load boxes of stuff for the project and for delivery to archived collection of his papers at the Canaday Center at the University of Toledo. Herb is legendary in so many senses. In particular, Sue calls him a pack-rat of effluvium. He saves almost everything: letters, memos, ticket stubs, notes…if time permits, I’ll post his reasoning on that here. It makes perfect sense. In the boxes he passed over and materials he sent on by mail later for the project were seven-inch reel-to-reel tapes and cassette recordings from the 1972 Dunbar Centennial that he organized. Also, there were reel-to-reel tapes, cassettes, and VHS tapes of his various other performances. Samples of some of those showed up in the film (and even more are here on the website), with the exception of the video from Midsummer’s Night’s Dream (I watched but have yet to digitize it). At some point this last summer and early fall I got around to digitizing the audio. It took the purchase of some vastly outdated equipment, having it restored to operating specifications, and weeks of tending, tweaking, ingesting, editing, compressing. Fussy, fussy work. I loved it. Okay, definitely NOT Dunbar. Still, I rolled in on the tape (fast forward) to make sure I wasn’t dealing with an audio palimpsest. I wasn’t, but I remembered thinking that Dr. Wesley certainly sounded very familiar, certainly someone I’d heard before. Well perhaps, I reasoned, it was the style of speaking, a certain preacherly cadence. I set the tape aside for consideration once the film was completed. Oh, the film was completed, and what fun it all has been…the premier in Dayton, the interest by so many of Herb’s fans. At the conclusion of the premier at the University of Dayton on January 16th, 2009, the film received warm applause. I was gratified. But when Professor John Inglis (he’d organized the showing and subsequent events) introduced Herb, the audience continued its applause and rose as one in a standing ovation. Well deserved. Ron, his wife, and I were treated like visiting royalty at Dayton. And. on my way home, mulling all of it I wondered what would be next. Every time you finish a film it’s like working yourself out of a job. But there had to be something next, right? And something associated with this project. What? Niggle, niggle went my brain. …The tape that didn’t fit in with the other project. There it was, sitting on the table behind me as I sat at my desk. I ought to get to that some day. But first I’d have to bring out and set up equipment, always a challenge in my clutter. Then came an e-mail and telephone exchange with University of Dayton Archivist Kerrie Cross. “I have this tape,” I said on Friday, Jan. 30th, at the conclusion of our other business. “I think it might be important. It’s about the state of race relations in the country and it has remarks from a Commissioner Crawford and a Charles Wesley, President of Central State College.” I explained when it was recorded and what little I knew from my cursory listen. She said that Martin Luther King had been in town, but a day earlier. Hmmm. I promised that I was going to take the time to listen and digitize the tape. I was right in all that I told her: we do hear about ten minutes of Commissioner Crawford and President Wesley. And then we hear Martin Luther King, Jr.
…More than 50 minutes as he thanks his audience members for their badly needed financial support, analyzes the state of race relations in America (We’ve come far, but there’s far yet to go. ), outlines his theory, commitment, and practice of nonviolence, and admits his resolve to die–if necessary–for his cause. The speech stops. Perhaps that was where the original tape ran out; it’s only three-quarters of the way through the tape on my machine. Nothing on the other side. That’s it. Dr. King was about two-thirds through an explanation of the three types of love, according to the Greeks. He covered eros, philia, and had finished the definition of agape but was making application of the concept. He was getting ready to make another major point when the recording stopped. How much longer did his speech run? Only someone who was there can tell us. And I hope there are many more than someONE who will. My first call was to Herb: “Do you know where this particular tape came from?” Nope. It might have been given to him when he was teaching a literature class. He did have a reel-to-reel tape recorder, but he’d never listened to THIS particular tape. And, besides, it was in a wrong box. Someone else could have mixed it in. The recording was made at 3 3/4 ips. This may be a copy of the original (I strongly suspect it is). There is a small piece of paper stuck to the reel with the name Chisholm written in ballpoint ink. Could this be the recordist? In a conversation with Herb he thought perhaps it referred to the late Shirley Chisholm, who while running for President of these United States in 1972, made an appearance in Dayton. Perhaps there is a tape in Herb’s effluvium of her addressing Daytonites (or Daytonians–somebody help me out here). If he finds it, we’ll digitize that, too. I ingested the tape into Pro Tools LE on a Mac and the file that you hear has been processed slightly…I rolled off some of the bass. This is a recording made by placing the mic in the audience, so it’s not a direct feed from the podium mic. The recordist is obviously technically very able, but he also is a member of this audience and I think you can hear him make several comments in agreement with Dr. King. As well, there is a little occasional whirring noise, what I take for a spring-wound film camera. That would indicate that there is film–probably 8mm film or maybe 16 mm film–of a few minutes of the event. Where might that be? So, we share this recording with the world; it belongs to the ages. And we solicit your photographs, memories…maybe even film that was captured during the event. We will share all these with the University of Dayton, and also, if they want it, with the King Center. And here’s a place to post comments and–we hope and pray–memories. If you have photos or other media, please contact me. So, history has been hanging by a thread these forty-four-plus years. And now history hangs by even a narrower connection: the electron. After all, that’s all this web site really is: electrons holding hands and promising to be good. We pray they will exist in the higher service of justice, equality, and love. 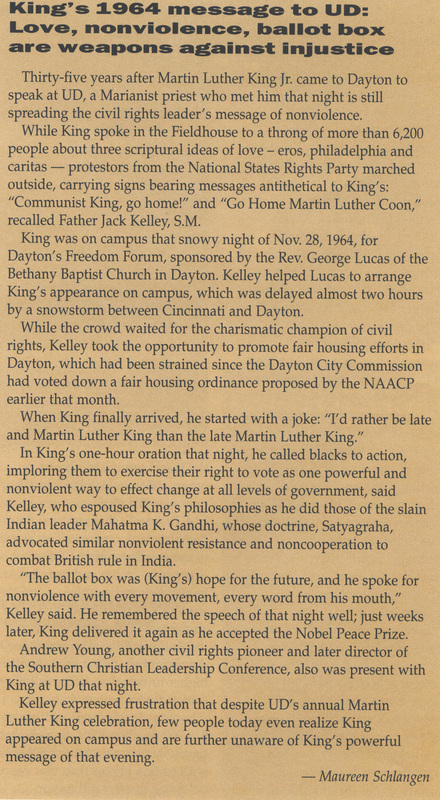 February 2, 2009–The University of Dayton Archivist, Kerrie Cross, has found more material about Dr. King’s visit. The article by Maureen Schlangen appeared in the January 29, 1999, issue of the CAMPUS REPORT (UD staff/faculty newspaper) page 4. Here’s a report from the Dayton Daily News that followed the event. As you can tell from the comments and the pictures not everybody thought it was a good idea to have the civil rights leader in town, an idea underscored by the comments of Commissioner Crawford. He may have been on hand to give Dr. King a key to the city, but he knew some doors would remain shut against him. Dayton Daily News, Nov. 30, 1964. Courtesy of University of Dayton Archives, Dayton, OH. Please click on the image to enlarge it. 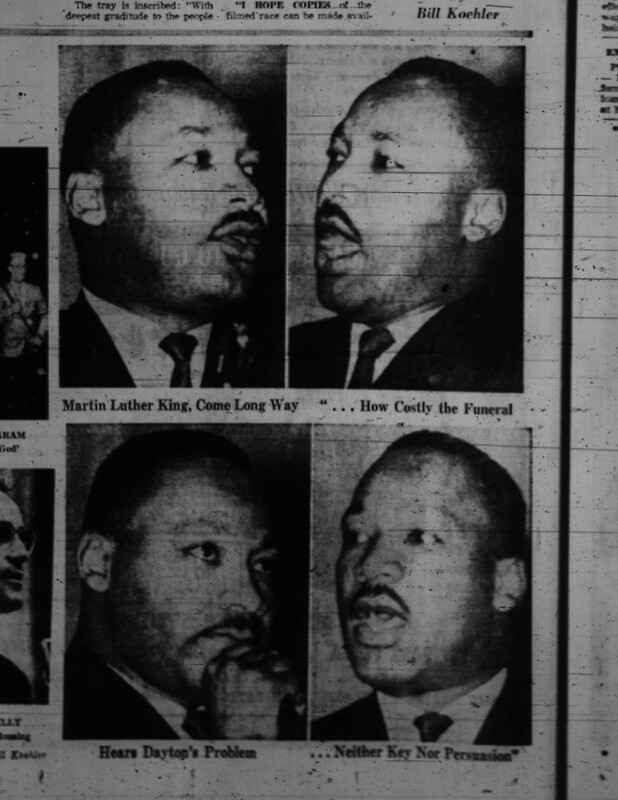 February 10, 2009–Cameron Fullam at the University of Dayton said that in his researches he’s found at least one more account of the recovery of a missing tape of Dr. King. The place was Western Michigan University, Dec. 18, 1963 and you can read about that here. If you navigate to the transcript of the speech you’ll find that it is much the same as his address in Dayton. Neat article. I saw your website in the CMU alumni magazine. I live here in Dayton as well. Born in 1973, this story is before my time, but I have always had an interest in the work of MLK. I scrolled down looking for comments to your article wondering if you have found any more info or tapes on this event. I was a Sophomore at UD when Dr. King spoke at the field house. I had come from a small town in Central Pennsylvania where there were very few African Americans. I knew most of them and growing up we attended school together, went to the YMCA together and played together. I was kind of naive because in this small town we hadn’t experienced the outright racism that was tearing apart our nation. Oh, there was racism, not the outright segregation that took place throughout the country,but the knowledge that blacks weren’t welcome in certain bars and clubs in this quiet little town. There were no signs but they knew they weren’t welcome. As a kid we weren’t really aware of this, it was a kind of a complacency on the part of blacks and whites alike and nobody seemed to break the “code”. Ironically in a senior class that contained no more than a handful of Blacks in the 50’s one of them was elected class president. He came from a family of several children all of them attended college and all of them were extremely successful as scientists, publishers and a teacher. Their father was well known to all of the kids for he worked at a local drug store that had a fountain. We would go there for ice cream and milk shakes in the evening. I think he was the janitor. He was a nice quiet man and to this day I am mystified as to how he and his wife managed to put all of those kids through college. Mind you there was no affirmative action and blacks didn’t get a lot of scholorships. So off I went to the big city of Dayton to attend the University and learn first hand that life in my little town was a fairytail compared to the real world. As a freshman at Dayton I was housed at the west campus in the old VA hospital. We had to take a bus back and forth to the main campus, about a 20 minute ride through the west side of Dayton. I then discovered what poor was as we traveled back and forth through the black section of West Dayton. The following year I moved off campus and lived in a small apartment with three other guys about a block from main campus. I remember the big fuss when Dr. King was scheduled to speak. I also remember the hate that took place as picketers carrying signs maligning Dr. King walked the sidewalk outside the field house. I don’t remember much of the speech but I do remember being awed by the powerful voice of Dr. King as I stood by the door for a few minutes. I remember that I had never seen that many black people in one place in my life. My college career ended that winter I think due to my lack of interest in studying and my fondness of 3.2 beer, but to this day I will always remember the pickets and the hate they promulgated. I was in the Navy when Dr. King was killed and I can still remember the sadness on the faces of my African American shipmates when the news came over the ships intercom. How different this world would have been had he lived a little longer. In 1964 I was your average overly intelligent nerdy science loving white boy (What’s that you say dear? Oh, I still am?). My dad was an Air Force officer at Wright Patterson AFB and my mom was a very intelligent and good looking lady who was very interested in the problems of the world and of our society. I don’t know why she picked me out of her six children but that afternoon she said “Put on your suit, you’re going with me to see Dr. Martin Luther King.” We drove about forty five minutes from Wright Pat through the dark and snowy night to the field house and then I sat with my mom for what seemed like an interminably long time (to a fifteen year old) waiting for Dr. King who had been delayed by the snow. He finally arrived and, after the usual acknowledgements to everyone, he apologized for being late. A few years later, on April 4th, 1968, when the news of his death came over the radio, the end of that apology came back to me and has remained with me to this day: “…and I said, “Now Ventral, you slow up a little. Tonight I’d rather be Martin Luther King late than the late Martin Luther King.” Little did we know… A great man.